Just discovered that three of my season-six episodes lost their soundtrack. Life goes on. Drag...going through my video library, and I discovered that my copies of three episodes from season six, "Weigh In, Way Out", "No Chemo, Sabe? ", and "A Coupla White Dummies Sitting Around Talking", have lost their soundtrack. This means my St. Elsewhere exploration will be accordingly limited until I can obtain uncompromised copies of those episodes. 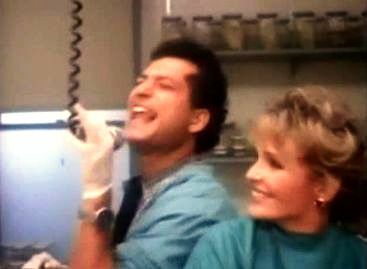 Wayne (Howie Mandel) rocks out to "Psycho Killer"
in the morgue with Jackie (Sagan Lewis). Probably not a huge deal in the grand scheme of things, but one of the major things I've been watching for is references to earlier storylines, and that's gone for those three episodes. The dialogue is kind of vital to that process. I'm particularly disappointed because "Weigh In, Way Out" earned an Emmy win for Mark Tinker's direction. I watched the three of them without sound the other day while I was doing some work on my laptop, and fortunately, I could recall enough of what happens in "Weigh In, Way Out" to appreciate it. In the most memorable storyline (for me) in "Weigh In, Way Out", the ninth episode of the sixth and final season, Wayne Fiscus is about to turn thirty years old. 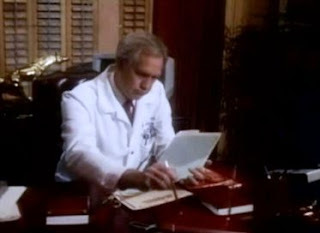 After Dr. Gideon chews him out for goofing around in the morgue to the tune of "Psycho Killer", he exacts revenge in super-glue in John Gideon's office, leaving Gideon to discover that the items on his desk -- his pens, pads of paper, drawers, and phone receiver -- have been glued down. When he tries to go for help, he discovers that the door is stuck, too. The scene is hilarious even without sound. I found I could appreciate why Tinker was recognized with an Emmy even more by just watching what happens. by master prankster Wayne Fiscus. Wayne matures a lot over the course of the series, so it would have been nice to have the dialogue for the scene in the morgue with Jackie where Wayne anxiously muses about the significance of the end of his twenties as the clock ticks down. Wayne hates authority figures, and I recall that at some point he tells a story about how he rolled a bowling ball down the hallway in high school and received a tongue-lashing from the principal, and that Gideon chewing him out reminded him of that, prompting him to indulge in one last act of immaturity before he reached the big 3-0. Or something like that. Character development is one of St. Elsewhere's strengths. More than any show before it, people at St. Eligius changed as a result of their experiences--the same ones we watched them go through. It would have been nice to have the sound for this one, as this is a pretty significant chapter in the mythology of Wayne Fiscus, the impatient, hormone-driven adrenaline junkie who becomes the mellower, deeper, more thoughtful person who leaves Boston to work with the poor in Nicaragua after he completes his residency. 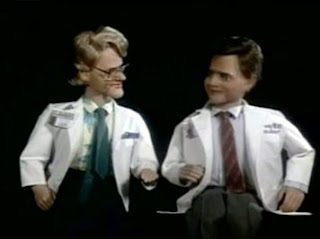 Unfortunately, the whole ventriloquism sequence with the Ehrlich and Craig dummies at the end of "A Coupla White Dummies Sitting Around Talking" is not palatable without hearing the dialogue. Definitely need the "talking" part to make that scene work. Ventriloquist dummies are creepy. A coupla white dummies sitting around talking. There's a lot of other good stuff that happens in these three episodes. John Gideon and Ellen's relationship develops. The artificial heart patient dies. Parent corporation Ecumena is forced to change its name for legal reasons, which was forced by real-life legal action from Humana. Wayne's father dies. Elliott's cousin Pee-Wee charms Dr. Novino. Guest stars Robert Picardo, Debbie Pollock, Michael Pataki, Bill Dana, Lainie Kazan, Matt Frewer, and Alan Young. I'm sure I'm missing some great Mister Ed jokes.